We recently took the latest fashion trends out to socialize at Coya Dubai with our friends, seasoned stylist, journalist and luxury publications fashion director Esther Quek, and car enthusiast Marko Vicentijevic. With our trend seekers on the hunt for the Ping life -what to wear and where to go this season-, a lifestyle and fashion photoshoot was on the menu. Coya’s multi-facet areas offering different colourful atmospheres are only enhanced by the incredible Peruvian menu, and we just had to take our time strolling from one room to the other. Starting with day outfits in hues of orange, Esther -in a Bottega Veneta dress- and Marco -in a Berluti outfit- chat in between the Pisco Lounge and the restaurant. Their outfits matching in colour, Bovet and Urwerk watches on their wrists, they discuss trends and truths. Black will always be the new black! Classical, classy, appealing and fit for all occasions. Valentino takes the LBD to a whole new level with an adorable dress, elegantly worn by Esther. After admiring the quirky deco of the blue and emerald Pisco Lounge, Esther and Marko grab delicious bites and refreshing drinks at the bar while keeping time in check with Blancpain. 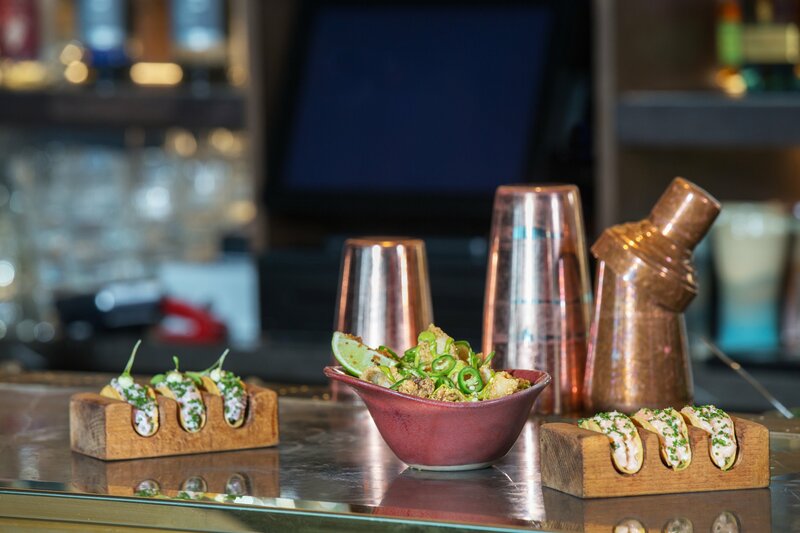 The Pisco Lounge bites menu offers many mouthwatering quick nibbles, easy to enjoy with cocktails or mocktails. The day’s appetite fell on Calamares Fritos con Ocopa: a nest of crispy baby squid curls, Peruvian marigold and quinoa, and a selection of Aton (tuna,yuzu and wasabi) and Salmon (salmon, tomato, avocado) Tacos. Coya’s Ceviches and Tiraditos are also a must, especially our favourites: the red snapper ceviche Pargo a la trufa with truffle, ponzu and chives, and the Tiradito de Serviola, thin slices of Amberjack bathing in dashi, truffle oil and chives. Complementing the Peruvian delicacies, the fruity, vitamin packed El Tamarijo and Virgen Picante (avocado, apple, cilantro, tabasco, lime and agave nectar) mocktails are definite energy boosters. An impressive wine list awaits those who prefer grapes to cocktails. 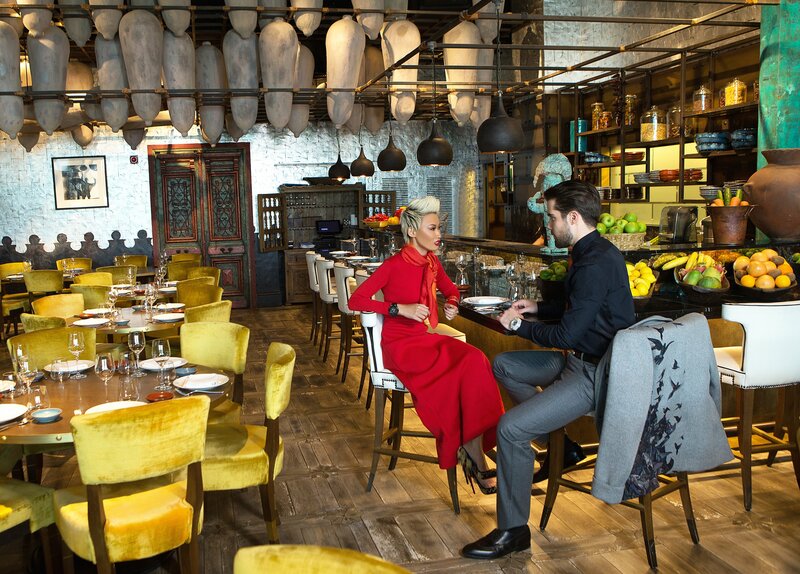 The main dining room, a vast area housing the Ceviche Bar, and a bit further inside, the turquoise walled Brassa Counter, makes for an ideal dinner setting. Esther and Marko opt for the laid back Ceviche Bar stools rather than the more formal seating style of the restaurant. A striking contrast of Hermes passion red and Salvatore Ferragamo shades of gray settle in for lunch, right on time with Hublot! The style-confident woman should feel as comfortable in a dress as in a suit… To be more specific, a man’s suit. Spicing things up at the end of a long shoot, we asked Esther to step out of her comfort zone and into a daring tone. 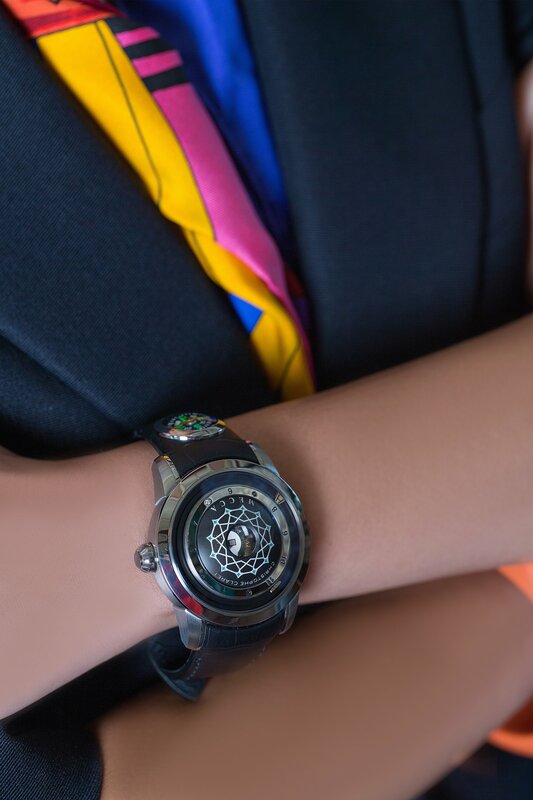 A mysterious stare hiding a fearless yet fun personality, a simple black and burgundy inlined Hermes suit taken in at several angles to fit her slim shape, an explosion of joyful colours and a quirky Christophe Claret timepiece. A long, fun, and entertaining shoot comes to an end… But it’s one of many long, fun and entertaining days for us! On to the next one! All photos are copyright of PINGDUBAI.com, no unauthorized duplication or reproduction permitted.